US President Barack Obama on Thursday announced a historic visit to Cuba next month, the first US presidential trip to the country in nearly 90 years and a dramatic symbol of the thaw in hostilities between the former Cold War foes. Obama, now in his final year in office, will meet with Cuban President Raul Castro, entrepreneurs, and “Cubans from different walks of life” during the March 21 and 22 visit, the White House said. First lady Michelle Obama will join him on the trip. “Next month, I’ll travel to Cuba to advance our progress and efforts that can improve the lives of the Cuban people,” Obama wrote on Twitter. Mr Obama vowed to press the communist government on human rights and other policy differences during the trip. "We still have differences with the Cuban government that I will raise directly. America will always stand for human rights around the world," Mr Obama wrote as he announced the history-making visit on Twitter. The trip will make Mr Obama the first sitting US president to set foot on the island in nearly seven decades. In a series of tweets, the US leader cast it as part of steady progression of normalising relations with Cuba, a communist nation estranged from the US for more than half a century until Mr Obama and Cuban president Raul Castro moved toward rapprochement more than a year ago. Since then, the nations have reopened embassies in Washington and Havana, eased travel restrictions and barriers for business, and have moved to restore commercial air travel. "There is much more that can be done by the United States and by the Cuban government to advance this opening in ways that will be good for Cubans and good for the United States. That is why President Obama is travelling to Cuba," deputy national security adviser Ben Rhodes wrote Thursday in a post on Medium, a blogging website. Mr Rhodes noted the ultimate aim is to persuade Congress to lift the trade embargo - an unlikely possibility in the near term. In addition to meeting with Mr Castro, Mr Obama will interact with members of Cuban "civil society", the White House said, referring to activists that advocate for various social causes. Prior to announcing the trip, Mr Obama said one of the conditions for a presidential visit would be the ability for him to speak to all kinds of groups - including those that oppose the Castro government. His stop in Cuba will be part of a broader trip to Latin America. 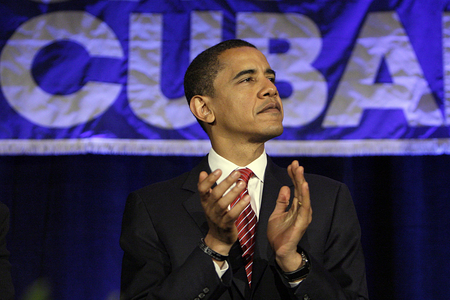 From Cuba, Mr Obama will travel to Argentina, where he will meet with the new president. Word of his travel plans drew immediate resistance from opponents of warmer ties with Cuba - including Republican presidential candidates. Texas Senator Ted Cruz, whose father came to the US from Cuba in the 1950s, said Mr Obama should not visit while the Castro family remains in power. Florida Senator Marco Rubio, another child of Cuban immigrants, lambasted the president for visiting what he called an "anti-American communist dictatorship". Mr Obama and supporters of the detente argue the decades-old embargo has failed to bring about desired change on the island 90 miles south of Florida.